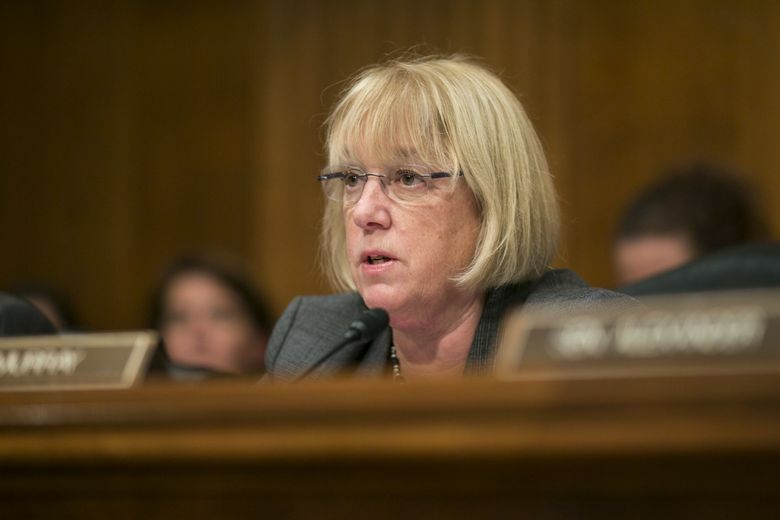 U.S. Sen. Patty Murray has condemned conditions in privately run immigration detention centers. But she's received the largest amount of campaign cash from private prison operators, including the company running the Northwest Detention Center in Tacoma. The private corporations that run immigrant-detention facilities across the U.S. tend to direct their political donations to Republicans in Congress. But in Washington state, the biggest beneficiary of private-prison campaign cash in recent years has been Democratic U.S. Sen. Patty Murray. Murray’s 2016 re-election campaign received $7,500 from private prison operators, including $5,000 from the Florida-based political-action committee for The GEO Group, the nation’s largest private-prison firm, according to Federal Election Commission filings and data compiled the nonprofit campaign-finance transparency organization OpenSecrets.org. GEO Group operates the Northwest Detention Center in Tacoma, which holds undocumented immigrants facing deportation by Immigration and Customs Enforcement (ICE), along with about 140 other such facilities nationally. The Tacoma center has faced protests and lawsuits alleging mistreatment of detainees. The political donations to Murray may seem jarring, given her loud condemnations of President Trump over separations of migrant children from parents, as well as her criticisms of federal taxpayer money going to private prisons. The contributions represent a tiny fraction of the more than $13 million raised by Murray in her successful 2016 bid for a fifth term. Still, the donations made Murray the top recipient of private-prison industry money among Senate Democrats in the 2016 election cycle (tied with Montana Sen. John Tester), according to OpenSecrets. In addition to GEO Group, Murray received a $2,500 donation from the PAC for Management and Training Corporation, a Utah-based company which also runs facilities housing immigrant detainees. The only other Washington member of Congress to receive private-prison firm money in 2016 was Rep. Dave Reichert, R-Auburn, who received a $2,500 donation from GEO Group’s PAC. None has received donations in 2018 so far. A Murray campaign spokesman dismissed the donations as inconsequential, saying she’d received thousands of donations in her last campaign — none of which would influence her decisions. “Senator Murray is a leading critic of President Trump’s horrendous policies that are increasing the needless and inhumane detention of immigrants and families, she has spent years working to shine a spotlight on what she called the ‘highly disturbing’ conditions at private detention centers, and she has been consistently aggressive and vocal in her opposition to federal spending on for-profit prisons that lack any meaningful transparency or accountability,” spokesman Eli Zupnik wrote in an emailed statement. Nationally, GEO Group and other private prison operators have given about $2.5 million to federal candidates — with about 85 percent of that going to Republicans, according to OpenSecrets. The largest recipient in Congress in 2016 was Sen. Marco Rubio, R-Florida, who received nearly $47,000. Some politicians and institutions have taken public heat for ties to the private-prison industry. In 2016, Hillary Clinton’s presidential campaign donated to charity $8,600 it had received from lobbyists for private prisons after pressure from activists, according to POLITICO. The Gates Foundation also has faced protests for investing more than $2 million in GEO Group. GEO Group has been hit with demonstrations and lawsuits over treatment of detainees at its immigration lockups, including the one in Tacoma. Washington State Attorney General Bob Ferguson sued the company in September, accusing it of violating state minimum-wage law by paying detainees $1 a day, or sometimes just in chips and candy. A company spokesman generally disputed mistreatment charges in a statement, saying its employees deliver high quality services to detainees, obeying federal guidelines. “Members of our team strive to treat all of those entrusted to our care with compassion, dignity and respect,” said the statement emailed by the GEO Group spokesman, Pablo Paez. GEO Group earlier had rejected Ferguson’s lawsuit as “baseless” and said its inmate work program is voluntary. The company, which earned more than $2 billion in 2016, has estimated its Tacoma facility would produce $57 million a year in revenue at its full capacity of more than 1,500 inmates. Some in Congress have pushed to eliminate private prisons entirely in recent years. In 2015, Vermont Sen. Bernie Sanders introduced one such proposal, called the Justice is Not For Sale Act. Neither Murray nor any other senator signed on to support it, but a companion measure in the U.S. House drew 30 co-sponsors, including Rep. Adam Smith, D-Bellevue. In September, Smith and Rep. Pramila Jayapal, D-Seattle, introduced a bill calling for the federal government to end private-prison contracts within three years and allow families to remain outside of detention while awaiting immigration proceedings. The proposal has 94 cosponsors. An identical Senate bill was introduced this week by Sen. Cory Booker, D- N.J., with nine Democratic cosponsors. A Murray spokesman said Friday she would be listed as a co-sponsor by next week. Material from the Seattle Times archives was included in this report.